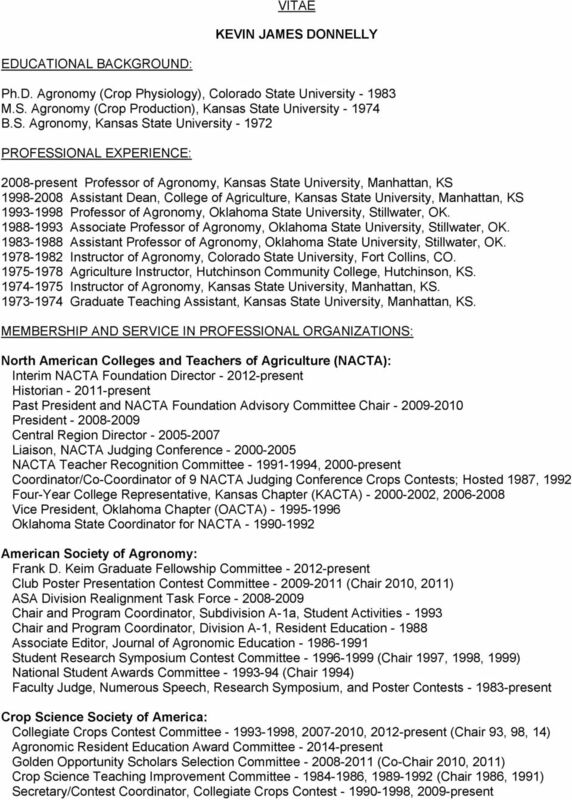 Download "VITAE KEVIN JAMES DONNELLY"
5 SUMMARY OF ACTIVITIES AT HUTCHINSON COMMUNITY COLLEGE ( ): Taught courses in Soils, Plant Science, Range Management, and Home Horticulture Developed computer assisted instruction modules for use in agriculture courses Instructor for community service night courses Academic adviser for students Faculty Adviser, Phi Theta Kappa Honorary Fraternity Faculty Adviser, Collegiate 4-H Club and Rodeo Club Member, Reno County Extension Council Chair, Reno County 4-H and Youth Advisory Committee ABSTRACTS OF PRESENTATIONS (TEACHING AND ADVISING): Donnelly, K.J. and D.J. Minihan K-State Department of Agronomy: Converging or Colliding Paths to the Future? Agron. Abst. Minihan, D.J. and K.J. Donnelly Nuts and Bolts of Freshmen Orientation: Preparation for life for Generation iy. NACTA Abst. Donnelly, K.J., D.J. Minihan, B. Haverkamp, J. Zimmerman and K. Kerschen The NACTA Crops Contest A capstone experience for program assessment and CCA exam preparation. Agron. Abst. Donnelly, K.J. and D.J. Minihan Are students responding to my text message during your class? NACTA Abst. Donnelly, K.J. and D.J. 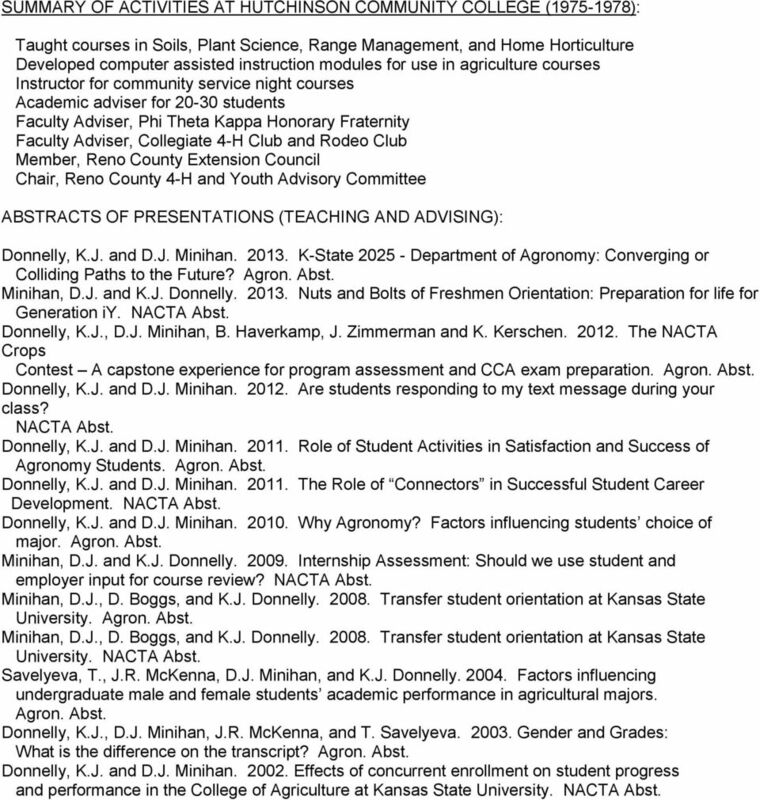 Minihan Role of Student Activities in Satisfaction and Success of Agronomy Students. Agron. Abst. Donnelly, K.J. and D.J. Minihan The Role of Connectors in Successful Student Career Development. NACTA Abst. Donnelly, K.J. and D.J. Minihan Why Agronomy? Factors influencing students choice of major. Agron. Abst. Minihan, D.J. and K.J. Donnelly Internship Assessment: Should we use student and employer input for course review? NACTA Abst. Minihan, D.J., D. Boggs, and K.J. Donnelly Transfer student orientation at Kansas State University. Agron. Abst. Minihan, D.J., D. Boggs, and K.J. Donnelly Transfer student orientation at Kansas State University. NACTA Abst. Savelyeva, T., J.R. McKenna, D.J. Minihan, and K.J. Donnelly Factors influencing undergraduate male and female students academic performance in agricultural majors. Agron. Abst. Donnelly, K.J., D.J. Minihan, J.R. McKenna, and T. Savelyeva Gender and Grades: What is the difference on the transcript? Agron. Abst. Donnelly, K.J. and D.J. 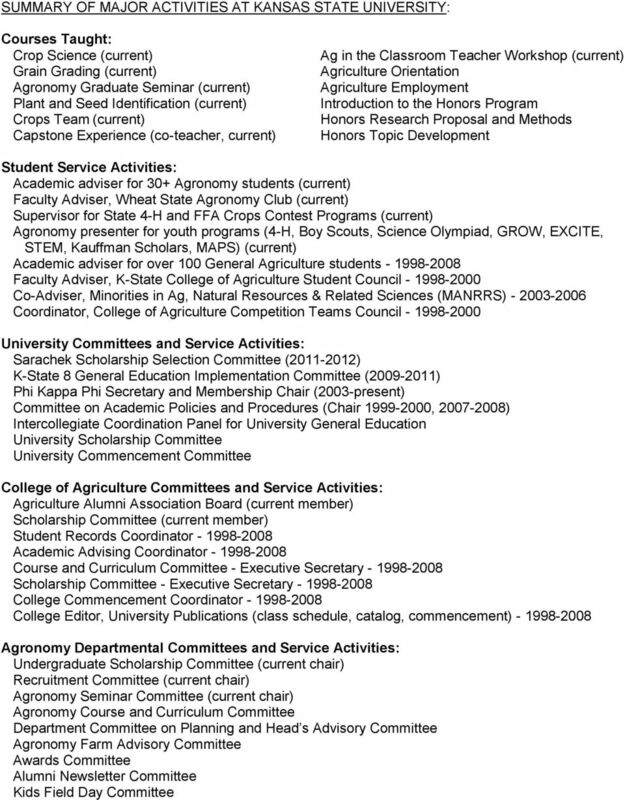 Minihan Effects of concurrent enrollment on student progress and performance in the College of Agriculture at Kansas State University. NACTA Abst. 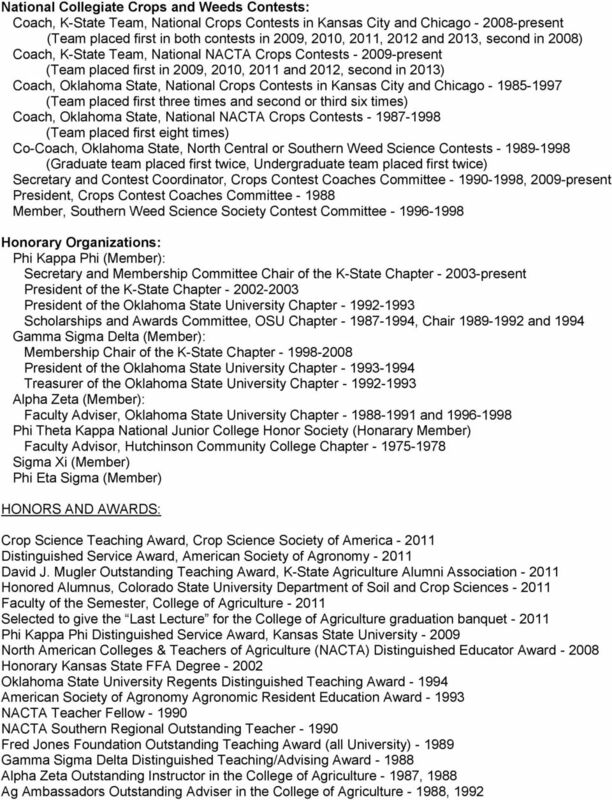 Page 6 of 11 Created 11-26-2012 13:05:28 Danielle Neal CURRICULUM VITAE DANIELLE L. NEAL. 2005 M.A. Political Science, Washington State University. RESUME Dr. James Christopher Lefler 108 Frank Hilbert Road Jonesborough, TN 37659 E-mail-jleflerhsd@earthlink.net CAREER OBJECTIVE EDUCATION Continuing a career in higher education administration and teaching. VITA. BETTY H. OLINGER, Ed.D., R.N. 1.1.1.1. 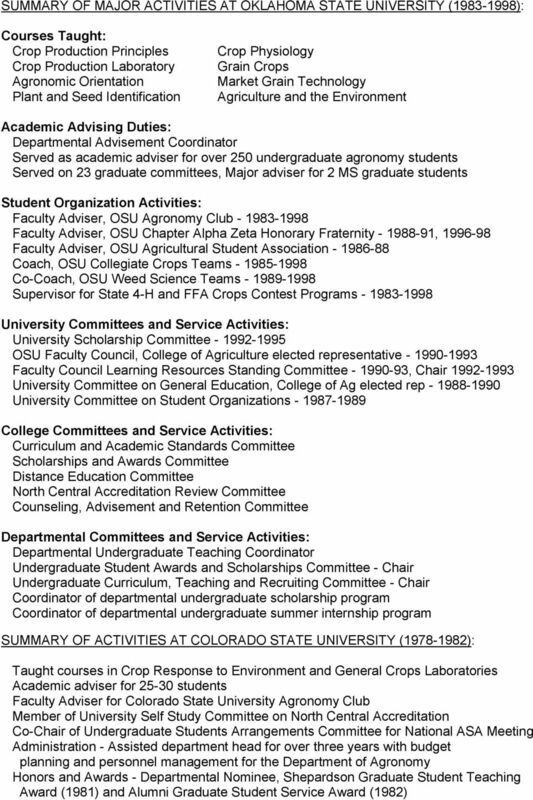 Draft created by Diversity subcommittee December 2001. Dr. Alicia Caudill is the Associate Vice President for Student Life and the University of West Georgia. She began this position in March 2013. Thomas A. Robertson HIGHLIGHTS OF QUALIFICATIONS 32 years of leadership experience in higher education with an emphasis on student services. 12 years of administrative leadership in pharmacy education. Alex P. Byrd Curriculum Vitae Home Address Work Address 135 Dotson Drive Unit 306 223B Curtiss Hall Ames, IA. 50014 Ames, IA. 50011 540-695-0123 apbyrd@iastate.edu 515-294-5872 EDUCATION Ph.D. M.S. B.S. JEANNETTE M. PASSMORE PAGE 1 OF 5 534 W 2 ND ST. DELPHOS, OH 45833 EMAIL: JEANNETTE.PASSMORE@GMAIL.COM MOBILE: 419.549.